Designers have many ways of making. They materialize information, objects, environments and experiences. As the design process is an investigative and iterative exploration that applies both experimentation and proposition, designers use many methods to study, communicate and reflect ideas. Studying ideas and proposing ideas requires skill and imagination. With practice and experience, making skills mature over time. Imagination needs nurturing and support to evolve, test and communicate ideas. There are many ways to engage the world, learn about the world and advocate for change in the world. Here are a few we like to use. There are many kinds of sketching/sketches used in design, including idea sketches, study sketches, referential sketches, memory sketches, coded sketches, information sketches, sketch rendering, and perspective sketches. Check out the Sketching Journey and start making sketches! 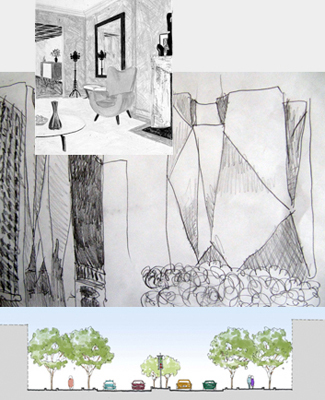 Sketches are done as part of concept design at the most visually creative stage to facilitate speed and spontaneity. Sketches are done to organize material connections, capture experiential views, and explore form and volume. Sketches are rapid communication tools that can effectively describe in pictures what in words is often hard to understand. Diagrams graphically illustrate information and statistics. A good diagram communicates information quickly and efficiently. Diagrams include maps, charts, annotated pictures, cartoons, photographs, drawings, sketches. 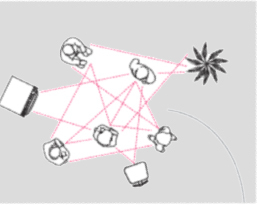 Diagrams offer the ability to depict an object or image, and to analyze it by revealing different properties such as scale, size, form, structure and content. Diagrams carefully control the hierarchy of information delivered with varying levels of text, font choice, color, graphics, etc. Drawings are created to study process, sequence, composition, image, physical and spatial relationships, experience, material connections and construction instruction. Building on ideas developed in sketches, drawings include scenario, storyboard, layout rendering, presentation rendering, diagram, perspective drawing, general arrangement drawing, detail drawing and technical illustration. 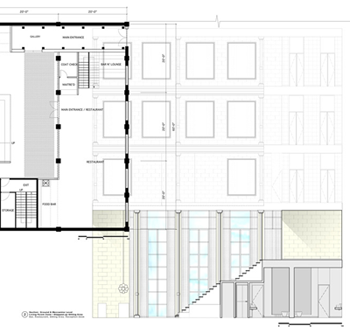 Drawings are part of design development and involve a process of selection and refinement to ensure that designs will meet project specifications. 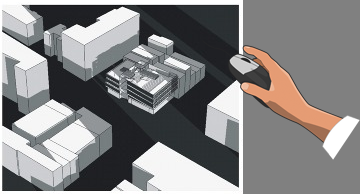 Architects and designers study relationships between design computing and physical output used for design representation and reflection with rapid prototyping and CAD/CAM (computer aided design and computer aided manufacturing) fabrication. Digital, hand drawn or mixed media animations illustrate events and experiences over time. Designers use animations to tell a story, to reveal changes in a design over time, and to communicate cause and effect relationships of dead and live forces on a design. Animations can represent narratives about information, objects, environments and experiences all throughout the design process. It’s time to have some fun! Collect as many materials as you would like. Collect natural materials (twigs, grasses, seeds, rocks). Collect soft materials (cloth, felt, ribbon, tape). Collect flat materials (paper, foil, wax paper, cardboard). Collect sticks (toothpicks, wires, string, dowels). 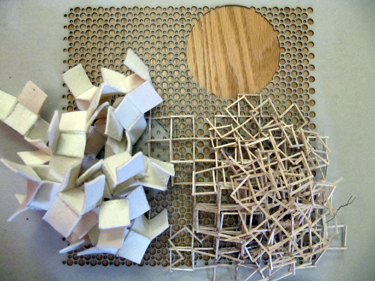 Collect modeling material like plaster or clay. Now that you have a good a mount of material, start constructing. First create at least five models using one material for each model. You will find that the materials themselves dictate form and space, solid and void. Learn how materials want to stand up, how they want to connect; what they look like and how they perform over time. Make these models as large as you wish! Construct imaginary places. Create an imaginary city with new forms, images and experiences. Examples of prototypes used in an iterative process include experimental prototype, alpha prototype, beta prototype, system prototype, final hardware prototype, off-tool component, appearance prototype and pre-production prototype. A prototype is part of detail design that supports final testing before manufacturing and carries the design through the specification of material selection and assembly. The prototyping process of design involves several iterations or studied steps to resolve issues, test, share, reflect, and evaluate. Projects that pass all of those stages develop into full construction.Physical construction means actually building the project yourself by hand, or by hand and digital fabrication combination or by digital fabrication alone. In the act of realizing a project full scale, the final and most serious evaluation takes place as the project is used, inhabited, and maintained or repaired. Design has many ways of making. Digital tools like computer-aided design replace traditional drawing and modeling. 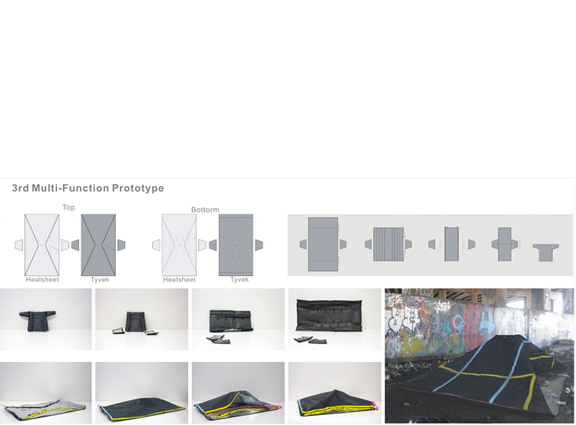 Designers choose which fabrication method serves their needs. People who learn to use computer programs don't need to learn how to draw. 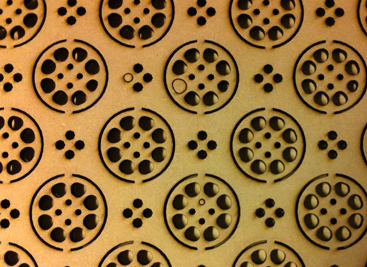 Digital fabrication is always faster than traditional fabrication.